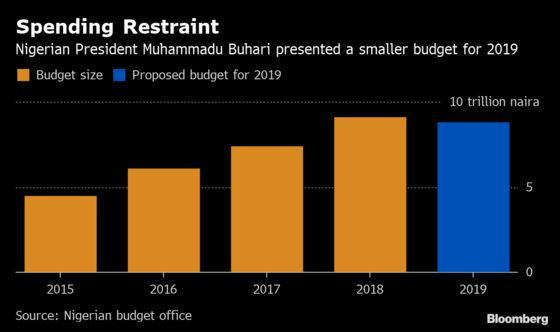 (Bloomberg) -- Nigeria will propose a supplementary budget later this year to boost capital spending and fund a 67 percent increase in the minimum wage as government revenues improve, the budget minister said. Additional spending plans will be funded from improved oil revenue as the price of crude rose to above $70 a barrel compared with a level of $60 that the 2019 budget was based on, Budget Minister Udo Udoma said Tuesday in an interview in the capital, Abuja. Nigeria, which vies with South Africa as the continent’s largest economy, is recovering from a downturn triggered by the 2014 crash in the price of oil, its key export and main foreign currency earner. After cutting the 2019 spending proposal due to revenue that was below target, the government wants to ramp expenditure on infrastructure. Gross domestic product is on track to expand 3 percent this year, compared with 1.9 percent in 2018, Udoma said. Nigeria has struggled to boost revenue, partly due to the government’s inability to grow its tax base and a failure to deliver on a plan to reduce its stake in oil joint ventures. The nation has earmarked 2.24 trillion naira ($6.23 billion) for capital projects, that include roads and rail, in 2019. Last year, it used only 46 percent of its capital budget after spending was cut. Lawmakers will on April 16 vote to approve this year’s budget. President Muhammadu Buhari has signed off on a plan to boost earnings by an extra 720 billion naira this year by reducing the country’s holdings in oil joint ventures with international producers including Royal Dutch Shell Plc, Exxon Mobil Corp., and Chevron Corp. Restructuring the assets will improve their efficiency and position them for better revenue performance, Udoma said. Other measures to boost revenue include expanding the tax base, improving efficiency of government spending and possible increase in value added tax from 5 percent, Udoma said.